The Orangeville District High School Bears junior girls basketball team is setting the court on fire this year going undefeated after ten games to lead the District 10 standings. 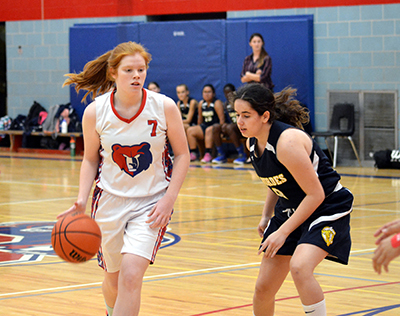 The team’s last outing against Bishop Macdonell on Thursday, October 19, ended with a 56-37 win for the Bears and increased their points total to 20 for the season. The Bears have averaged 59 points per game this season. They have outscored their opponents by an average of 31 points per game making them a powerhouse squad in District 10 play. The team met the squad from Our Lady of Lourdes on Tuesday, October 17, on their home court in the ODSS gym, and were leading 33-7 at the half based on some solid defensive play and aggressive offensive strategy that includes some impressive moves in setting up their position on the court and some serious shooting ability. “Last year we had three really strong grade nine players. Now we have three grade tens, the rest are are all in grade nine. We finished the game (Oct. 17) with all grade nines on the floor,” said coach Wayne Feeney about how strong this team is even with first year high school students making up the majority of the squad. The team is undefeated in the regular District 10 season but met some tougher opponents during tournament play. Top scorers Alicia Bowering and Marta Suarez have made a significant offensive contribution to the team this year. “In tonight’s game Marta had 14 points and Alicia had 14 points and they sat for half the game. The two of them facilitated other players. We’ve had games were Marta scored 35 and Alicia scored 21. The rest of the kids really improve by playing with those two (both grade ten players),” Feeney said adding that much of the strength on the team comes from the fact that most of the grade nine players have a lot of experience playing in clubs outside of school and have been involved in the sport for several years. The Bears will be playing today (Thrs., Oct. 26) when they travel to Guelph to take on Centennial Collegiate. They will be on their home court at ODDS on Tuesday, October 31, to host Guelph Collegiate.